As the first significant snow falls across England, an observational report is provided by Brian Bell as regards the difficulties experinced in Cumbria, from the aftermath of the heavy rains. He has also provided the modern day bus images. The first of the two journeys of the day on the new (started on 4th January) Pooley Bridge shuttle, the 0932 ex Penrith Rail Station is seen at Penrith Bus Station. Interestingly there is a driver change here, after just a few minutes service, as effectively this shuttle bus also works as the ferry bus for Whinfell leg 104 drivers to get to / from the depot. Local press reports suggest a new bridge should be open at Pooley Bridge by Easter. As you enter that village, some wag has put masking tape over the "Bridge" part of the village sign, effectively renaming it "Pooley" Buses turn by means of a U-turn outside the Crown Inn. Not surprisingly I was the only person on the bus out to Pooley Bridge, but we picked up 2 pensioners there for Penrith, no doubt pleased to have a bus service again, but clearly they were unaware of the bus not serving Penrith Bus Station on the way in, as they ended up at the Railway Station not very happy, whereas they could have alighted in the town centre. 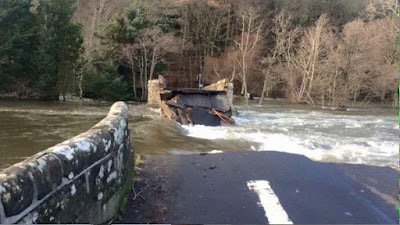 Eamont Bridge is also damaged, and therefore closed and buses have to divert via A66 to near Brougham Castle, and then via an extensive one way system to reach normal line of route by the Crown pub at the south end of the village of Eamont Bridge. Outward the bus goes via the lanes through Fremington, Moorhouse and Clifton Dykes to the A6, returning via the A6 and Pembroke House to reach the B6262 at Brougham. 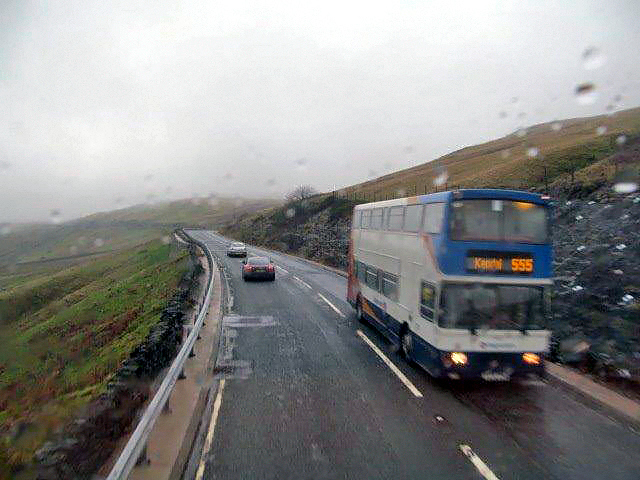 All these sections other than the A66 and A6 are not usually served by bus. The normal two hourly 508 to Patterdale has to divert between Penrith and Waterfoot (on Ullswater) via the A692 past Dalemain House, another long section normally bus less. 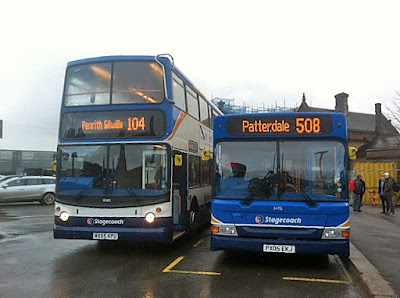 I had totally failed to pick up that the X4 and X5 Penrith to Workington is now Stagecoach Gold with double-deckers, although the X4 is having to run along the X5 route at present due to another damaged bridge. The diverted section of 508 to avoid the damaged bridges at Eamont and Pooley is not especially exciting, although offers fine views of the National Trust Dalemain House and the very high and fast flowing River Eamont alongside. The normal route is regained at Waterfoot. Ullswater is particularly high still as well, with sections of the road still flooded, but easily passable. There is a short section where part of the road has collapsed into the water, controlled by traffic lights, and a few places where the retaining wall has succumbed, but generally there are few signs of any major problems until you get to Glenridding Village, where the banks of the beck are having to be totally rebuilt, and businesses are still clearing up after being flooded out four times. As can be seen in the photo, a 38-seat Plaxton bodied Dennis Dart was operating the 508, which I guess is usual since the last of the Volvo B10Ms were taken off. On the 1320 ex.Penrith I was the only passenger all the way, but the 1420 ex.Patterdale was patronised by one lady from Patterale to Glenridding and two gents from there to Penrith Hospital. The driver was saying its never busy in the winter but the current situation seems to have reduced loadings even further still. I asked the driver whether the open top operation between Penrith and Patterdale last summer was a success or not, and he reckoned loadings were good on pleasant days, but no one could understand why the open topper was not used on through journeys over the Kirkstone Pass to Windermere, as he had done his route learning for the route on a Volvo Olympian, so double-deckers do fit. Maybe next year? But there has been a change of management since last summer, so it may not run at all this year. Today both buses on this hourly temporary Penrith Rail Stn to Kendal Bus Stn service were double-deckers. One Volvo Olympian and one Dennis Trident. Buses display route 555 but have the correct destination details of "Kendal via M6" and "Penrith for Keswick"
I had feared that the "via M6" would entail them using the M6 all the way to Tebay thence as the Cumbria Classic Coaches' route 570 or even to the Sedburgh Road (albeit needing to divert around the low rail bridge in Kendal) - both of which I have done on deckers in the past. But fortunately the timetable is headed via M6/A6 and the Motorway is only used from Junction 40 at Penrith to Junction 39 near Shap Summit (which includes the section of Motorway where the northbound and southbound carriageways are a considerable distance apart - so you need to do it both ways!). After that, they run across Hardendale Fell to join the A6 just south of Shap. The section of route between Shap and Kendal along the A6 past Shap Fell and Selside is extremely scenic, and is highly recommended, especially in a double-decker. Not sure whether in years gone by this road ever had a regular bus service, as far as I recall there was just an early morning Apollo8 106 that ran that way, something I always intended getting around to doing, but never did before it got withdrawn, so am especially pleased to get a chance to do it now. The driver was saying that the use made of the 555A is not much, although today my three journeys had 10, 8 and 4 passengers. However it certainly does not justify double-deck operation, so may be worth doing before they realise that !! 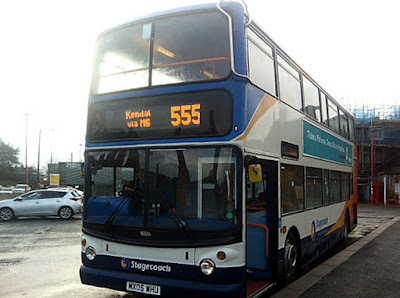 Once the road around the west shore of Thirlmere is opened for the 555 bus, the 555A will obviously cease.,The driver said he had no idea how this Thirlmere road service was going to be provided, or indeed whether it would even be Stagecoach doing it. However he said it is possible to get a double-decker round the road, as it has already been done once when there was an accident. Traffic into Kendal from the north was a nightmare, mainly because of another damaged bridge, as a result a Dennis Trident was being used as an extra bus on the 43/a in order to maintain a decent sevice on the normally linked 41/a and 43/a routes. The driver also confirmed there are scheduled double-deck journeys on the 45 to / from Burneside on a school day, he thinks the 0905 is one of them. 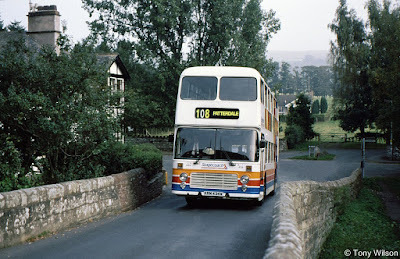 He also said that the only Kendal local route that cannot use double-deckers is the 42/a. As usual the 555 and 755 seemed to be all double-deck. Since my last trip on the route, the 555 has a small additional double run north of Carnforth to serve the Pine Lake resort. A reminder of better days for the 508 route. 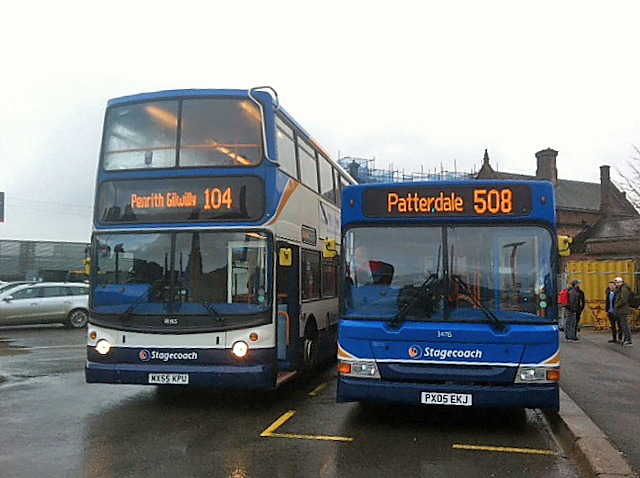 Previously as the 108 it was operated by Bristol VRs from the Stagecoach Cumberland fleet. Illustrated is fleet number 434 as it climbed up onto Pooley Bridge bound for Patterdale in September 1998. The bus along the west shore of Thirlmere will not be the 555 but a special shuttle service. 555 will not return until the A 591 is open again and this is May at the earliest. So 555S has a lot of life in it yet.